This level is much hard and you need to play with patience to break jellies first slowly with normal candies then with special candies after moon struck to play with balancing the Odus Owl. You might need few striped candy that you could use with balancing the odus owl to break top grills so candies start to appear on board. After moon struck you might need to play with special moves to reach requirement. 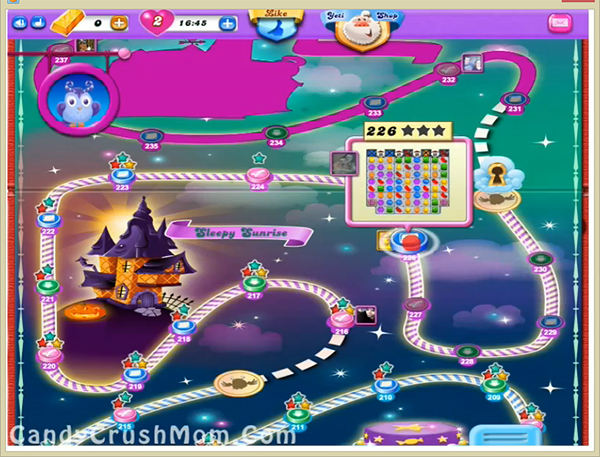 We completed this level with 661560 score by playing with normal candies first and after moon struck candies break automatically and we reach requirement easily with three star score. Great game puzzle,I”m finally at level 226 and stuck ha,ha. I will eventually get it but if there is a trick to it let me know. Yours sincerely, happy candy crusher.